If fashion had a drink, it would be gin. Once considered the choice drink of "old ladies," gin has rapidly come back into vogue thanks to a newfound focus into craftsmanship in Scotland, with a staggering total of 25 gins being added to 5pm's Ginfographic. We're in the midst of a great Scottish gin boom. Ever committed to the sesh, for the absolute benefit of public interest only, we headed to the Academy - a pop up gin bar located within the Finnieston - to embark on an exploration of the hottest of Scottish distillers with gin guru, Jamie Moran. First up on the flight was Lussa Gin, produced at Ardlussa, on the Isle of Jura. What initially drew me towards this gin was the earthy composition - with the gin boasting botanicals including: juniper, coriander, lemon thyme, orris root, water mint, honeysuckle, rose petals, ground elder, elderflower, rosehip, lime flowers, boy myrtle, scots pine, sea lettuce and lemon balm. Never one to gulp a good gin straight down, we grilled our knowledgeable gin guru from the Finnieston, Jamie Moran on the background of the distillery. Needless to say we were delighted to learn that Lussa is run by three women (girl power!) and the gin itself is made from herbs foraged on the island itself - meaning that no two batches are the same. Onto the tasting, Lussa Gin was surprisingly herby - but not in an overpowering way. To describe the gin itself, it was very mild! To compare it to a more recognisable high street brand, it's initially similar to a Hendrick's in botanical tones, but the citrus punches through, followed by a very herby aftertaste. The resulting finish? Something similar to the air between your teeth and crunching a Parma Violet sweetie - comfortingly nostalgic. Otherwise known as the "Brew Dog" gin, Lonewolf, as the aforementioned may suggest, is the botanical child of the much-loved Scottish-born craft brewery. Produced in Ellon, Aberdeenshire, the gin boats a flavourful composition of juniper, grapefruit peel, lemon peel, cardamom, pink peppercorn, angelica root, orris root, coriander seed, mace, lemongrass, lavender flower and kaffir lime leaf. The distillery is currently distributing the third release of the gin, however, for our flight, I had the pleasure of tasting the second batch - debated by some to be the better of all the releases to date. Lonewolf gin is one of the few in Scotland to be made entirely from scratch - including the process of growing potatoes, and processing to create the base alcohol. Tasting the gin itself, it becomes immediately apparently, that like many of Brew Dog's products, there is a great deal of care that goes into producing a superior product. It provided quite a contrast to the previous gin of Lussa. It is a very summery gin - offering a punch of zest. All in all, very refreshing. My final gin of the flight was that of Achroous, made closer to home, in Leith, Edinburgh. Achroous, again, is vastly different to the previously described gins, this time offering a rather exotic composition of juniper, coriander seed, orris root, liquorice root, angelica root, fennel seed and sichaun peppercorn. To judge a gin by it's bottle would be a terrible sin - and even more so, to overlook Achroous. 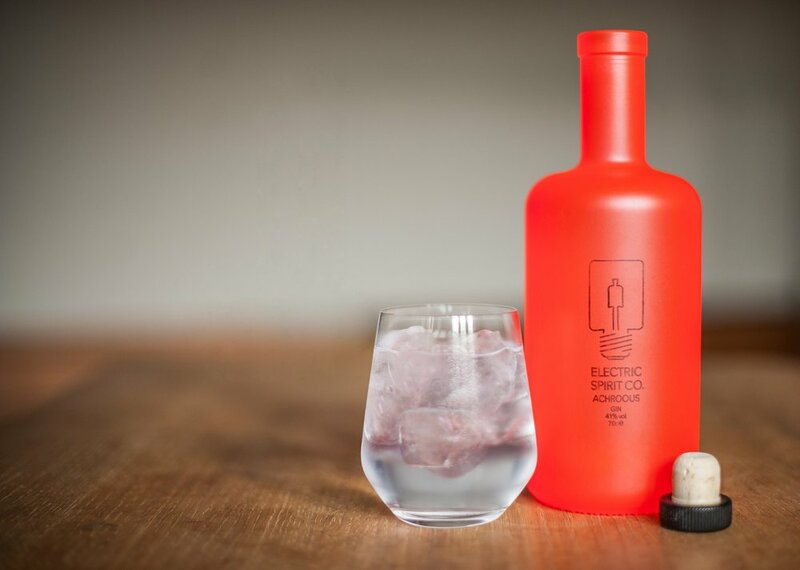 Unlike the craft-style, artisan gin packaging styles of recent popularity, Achroous presents itself almost like a party spirit, in a blood orange, almost neon bottle. Truth be told, it would not have been my first choice based on visuals alone, but with the reassurance of our very knowledge gin guru, Jamie, I decided to give it a go. Achroous did not disappoint - this time offering peppery and earthy tones - the perfect gin for a spice-lover like myself! My first gin of the flight was the Kintyre Gin, made in Carradale, just outside of Campbeltown. Drawn to the unusual composition of juniper, coriander, angelica, almond, liquorice, Icelandic moss, sheep sorrel, orange peel, lemon peel, cassia, cubeb berries and orris root, my gin came complete with a garnish of fresh juniper berries, mint and angostura bitters. As a distillery, Kintyre Gin are unique in their commitment to sustainability. Their copper stills being powered entirely by a hydro-electric scheme located on site. 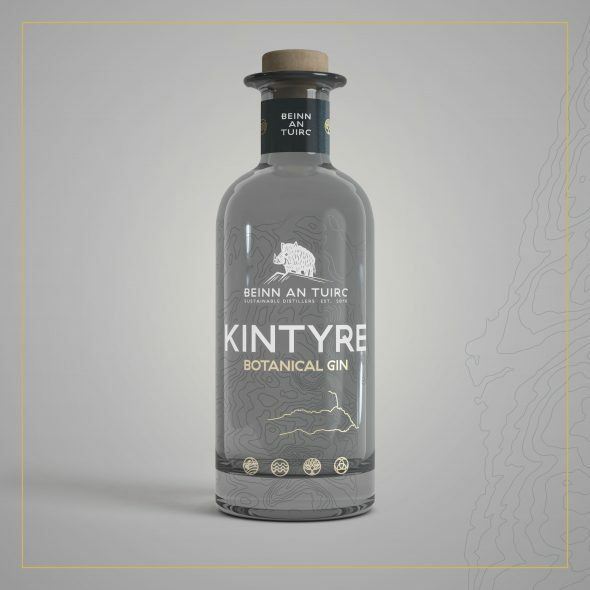 Like most distillers in the Highlands and Islands area, Kintyre take advantage of the pure, natural waters available locally, which contributes to the finish of their final product. Kintyre Gin also extend their social responsibility to the nearby living community, to support start-up businesses and entrepreneurs locally. Onto the tasting, Kintyre can be quite overwhelming for those who aren't huge liquorice fans, however, once past the initial hit, deeper flavours begin to emerge - and I enjoyed the clear and full flavour of berries, orange, lemon zest and coriander. Kirsty's Gin was arguably the most favoured gin of the evening by both myself and Laura. Made in Inverkielor, Angus, Arbikie's composition list is short and sweet: just juniper, kelp, carline thistle and blaeberries. 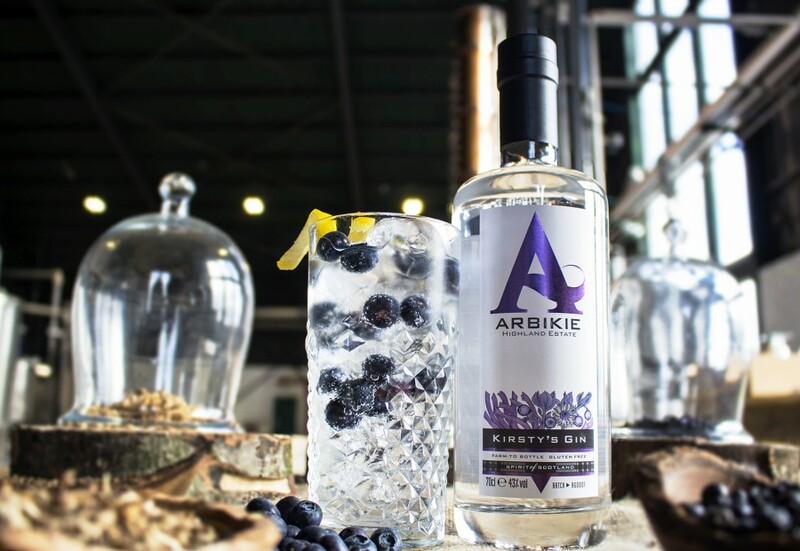 Produced by fourth generation Scottish farmers, like Lonewolf, Arbikie produces their gin from farm to bottle, all upon the same estate, taking inspiration from the surrounding Eastern coastal elements of ocean, rock and land, channeling their heritage into the final product. The resulting gin is really quite surprising. 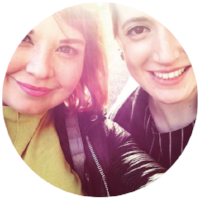 Kirsty's Gin was more akin to a White Russian than a botanical gin, and that is exactly what I loved about it. Creamy, smooth and easy to drink, I could also extract slight herbal notes from the gin with kelp and Carline thistle coming through. A garnish of blueberries added the perfect finishing touch to this glorious gin! From East to West, my last Gin, the "Wild Island" Botanic, from Scalasaig in the Isle of Colonsy, was bursting with herbal zest. I couldn't resist the composition of juniper, coriander, sweet Meditarrean lemon peel, orange peel, angelica, cassia, cinnamon, liquorice, nutmeg, orris root, lemon balm, water mint, meadowsweet, heather flowers, sea buckthorn and boy myrtle. Wild Island Botanic Gin is hard to come by, as the distillers produce in small batches, releasing just 750 bottles at any one time. For this reason, a Wild Island is highly sought after by gin lovers everywhere. Onto my tasting, the gin was served with lemon tonic. 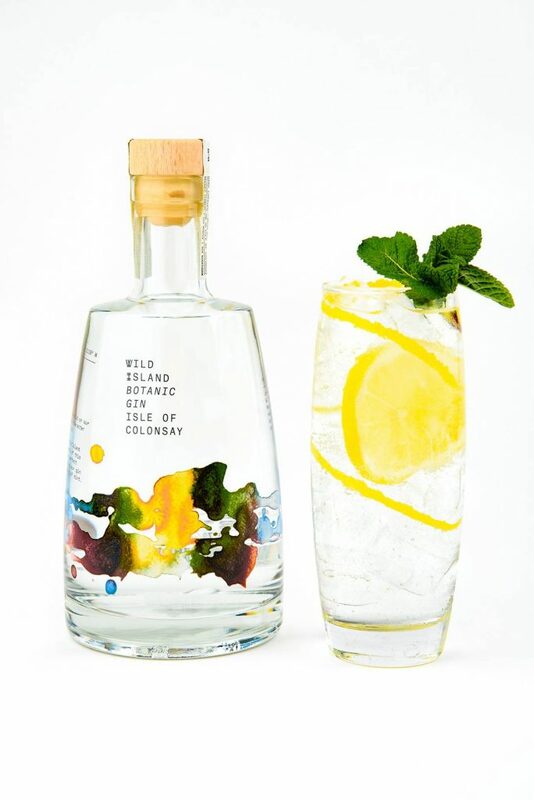 Wild Island is the quintessential refreshing summer gin. The juniper, corriander, cinnamon and wild array of herbs give it a kick - the lemon tonic and sprig of mint cools down to offer the most refreshing and drinkable gin and tonic combo. The Great Scottish Gin Boom - What's Next? Gone are the days of cheap rocket fuel masquerading as "gin" in Scotland: distilleries are popping up right, left and centre to provide a superior product which, unbelievably, is set to surpass whisky sales in the UK by 2020. Our gin flight at the Academy barely made a mark on the map - however, all gin should be enjoyed in moderation - and our journey continues to try more and more of the craft distillers that are bringing Scotland new acclaim as a gin producer. The next time you hit the town for an evening of gin tasting, take advantage of the great Scottish gin boom - and try swapping your Gordon's or Bombay Sapphire for something a little closer to home. 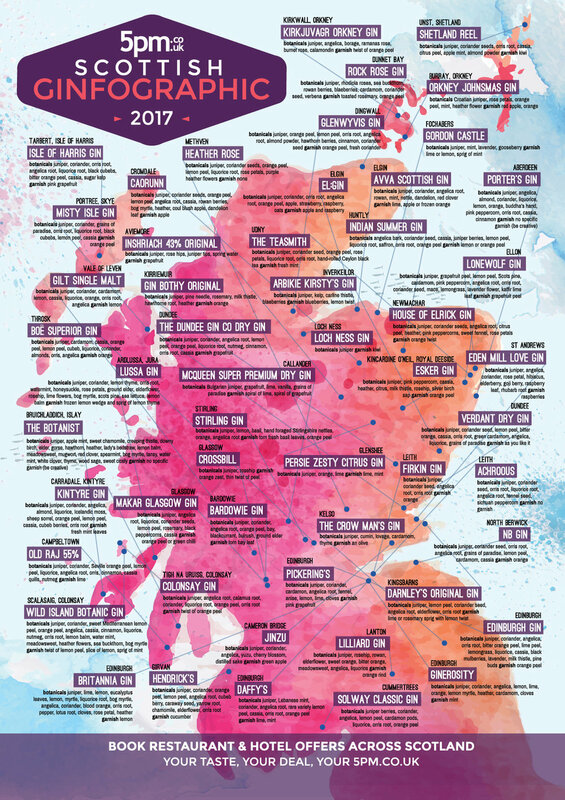 What Scottish Gins have you tried from the 2017 map? What is your favourite? Tell us in the comments below!